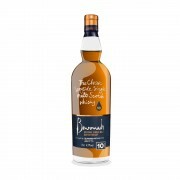 The Benromach 10 has gotten a lot of attention lately, but it seems we don’t have it here in Taiwan. Instead, we’ve got a 12 year old OB which doesn’t seem to exist in the rest of the world. I can’t find much information online about it. It might be one of those “just in Taiwan” cases. I contacted Benromach to learn more about this bottle’s production and distribution, but they never got back to me. So for now I'll stick with the assumption that this is a Taiwan exclusive. Nose: Rather farmy and robust. Rich caramel, red apples, cereal, barley, wheat, gentle peat, sultanas, dates, hay, and earth. Palate: Medium-bodied, with juicy raisins and dates on arrival. Rich caramel, big leather, chili powder, roasted corn-on-the-cob, sweet potato, indistinct sherry, cherry, and praline. Finish: Medium-length. A strong leather note, caramel, orange rind, red apple, apple cider, musty oak, varnish, dates, barley, sweet potato, cherry, with paprika and chili powder giving it a spicy kick. Lingering mint and caramel. Thoughts: On paper, it’s an all-rounder. Sherry, peat, and barley are all here. But the peripheral flavours and the farmy character make it a pretty unconventional dram. Very leathery and sweet. Closest in profile to, say, a Springbank, if I had to compare. But Benromach is very much its own thing. Very original and very “craft” tasting. An excellent and affordable dram from an often-overlooked distillery. Recommended. Very informative review, @hunggar. I had not heard of a 12-year old Benromach before, although there apparently was one version in earlier times, bottled at 40% ABV. Seems like you do have a special thing there in Taiwan. Enjoy! @Pierre_W, yes I've checked Whiskybase and it's none of the 12 year olds listed there. This is a modern bottling with the newly styled label. Strange. I wonder how many other under-the-radar OB's are out there which are being produced exclusively for specific markets.